Bitcoin price traded higher and broke the USD 6,620 - USD 6,650 resistance zone. Ethereum spiked above USD 230 and later corrected lower. NAS, MKR and MONA gained between 8%-15% today. Bitcoin price traded with a bullish formation above the USD 6,500 support. BTC/USD traded above the USD 6,620 - USD 6,650 resistance zone and even spiked above the USD 6,700 level before starting a downside correction. Similarly, there was a positive move above the USD 225 level in ethereum price, but it struggled to stay above the USD 230 resistance. 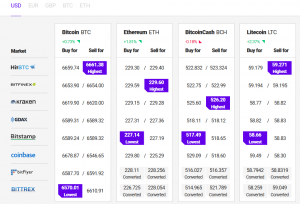 The overall technical structure for bitcoin, ethereum, bitcoin cash, ripple and litecoin is positive. There was an upward move in bitcoin price above the USD 6,600 resistance level. BTC/USD climbed higher and broke the USD 6,650 resistance as well. However, buyers struggled to keep the price above the USD 6,700 level, resulting in a downside correction. The price is currently (UTC 08:20 AM) up around 0.5% and is trading near the USD 6,650 level. On the upside, the key resistance is at USD 6,700, above which the price is likely to accelerate gains. On the downside, supports are seen at USD 6,620 and USD 6,600. Ethereum price also followed bitcoin and climbed above the USD 230 resistance. However, ETH/USD was rejected above USD 230 and the price is currently consolidating between USD 227 - USD 230. On the upside, a proper close above the USD 230 resistance is needed for a push above the USD 235 and 240 levels. On the downside, the USD 225 level is an initial support, followed by the USD 220 level. Bitcoin cash price did not perform well and remained in a tight range above the USD 520 support. BCH/USD must break the USD 540 resistance for an upward move in the near term. On the downside, below USD 520, the price could test the USD 500 support in the near term. Ripple price started an upside correction from the USD 0.470 support. However, XRP/USD is facing a lot of resistance near the USD 0.490 and USD 0.500 levels. The main support on the downside awaits near the USD 0.465 level. During the past few hours, a few altcoins like NAS, MKR, MONA, NOAH, PPT, POWR, ONT and XTZ gained between 7%-15%. Out of these, NAS was up around 15% and MKR gained roughly 10%. To sum up, the current market sentiment indicates more gains in bitcoin. If BTC/USD settles above the USD 6,700 level, there are chances of further upsides towards the USD 6,800 and USD 6,850 levels. Similarly, ethereum could gain bullish momentum if buyers succeed in powering the price above the USD 230 and USD 235 levels.